Lama Deshek will lead us in learning and practicing the guru yoga of the great adept and founder of the Gelug lineage, Lama Tsongkhapa. Feel free to bring offerings for the alter or snacks to share if you'd like, but this retreat will not include a potluck lunch. Retreat on the Seven-Limb Practice. Lama Deshek will teach the meaning of this very important practice along with instructions for the way it should be performed including offering water bowls and prostrations. Bring offerings for the alter or snacks to share if you'd like, but this retreat will not include a potluck lunch. Retreat on Chenrezig, the Embodiment of Compassion. Please, join us for this special retreat on Sunday, August 12, from 1 to 4pm. Bring your malas (Buddhist rosaries) to use during mantra recitation. There's no need to bring food. There won't be a potluck this Sunday. But if you wish to bring an offering for the alter such as flowers or fruit, that will be welcome. We'd be so pleased to have you, your loved ones, and friends to join us for our annual Losar Potluck. We will be gathering at the Center this Friday evening, February 16th at 6:00 pm. Please, bring a vegetarian dish and/or non-alcoholic beverages to share. Help us start the year of the earth dog right with friends and good food! We will not be meeting on Sunday, February 18, 2018. Since we won't be meeting on this Sunday, that's all the more reason to come join the Losar festivities Friday evening, February 16 at 6:00 pm. We will be having a special practice for Saka Dawa, the holy month honoring Lord Shakyamuni Buddha. Practice will begin at 6:30 pm, tomorrow June 9th. We hope everyone we be able to come! Lama Deshek will be leading a Chenrezig Retreat at the Center this Sunday, June 4th. The Retreat will begin at 9:00 am. We will have a few breaks, one for lunch. Please, bring a vegetarian dish and/or non-alcoholic beverages to share. Everyone is welcome. We hope to see you there! Please, join us for a reception to celebrate another successful Mandala event. We will meet at the Center at our normal 1:00 PM time on Sunday, April 16th, to enjoy some refreshments and fellowship. Everyone is welcome. We hope we'll see you there! Thank you so much, Geshe Lhakdor, for such and insightful and educational talk. We hope we will be fortunate enough to visit with you again soon! 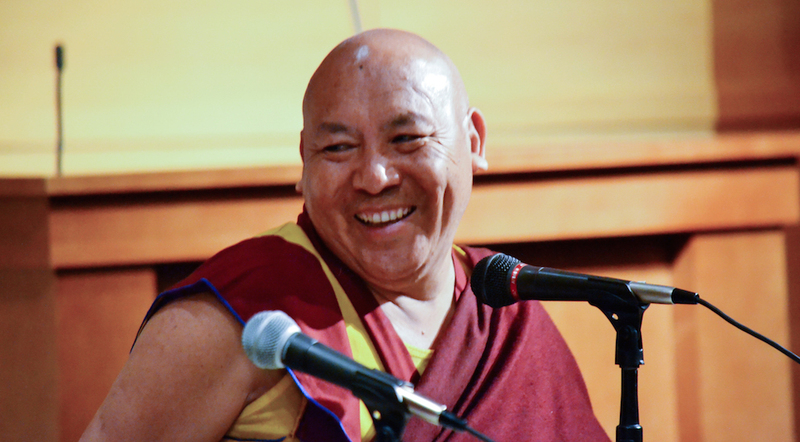 Venerable Geshe Lhakdor will be gracing us with his presence at our Center on Wednesday night at 6:30pm. We are so thankful to Geshe Lhakdor for such a rare opportunity to greet and learn from His Holiness the Dalai Lama's former Enlish translator. Please, join us for this fortunate occasion and to show our honored guest the warmest welcome. We are pleased to announce that Lama Deshek will be undertaking the construction of a Chenrezig sand mandala at the Birmingham Museum of Art as a part of their month-long IndiaFest celebrations. 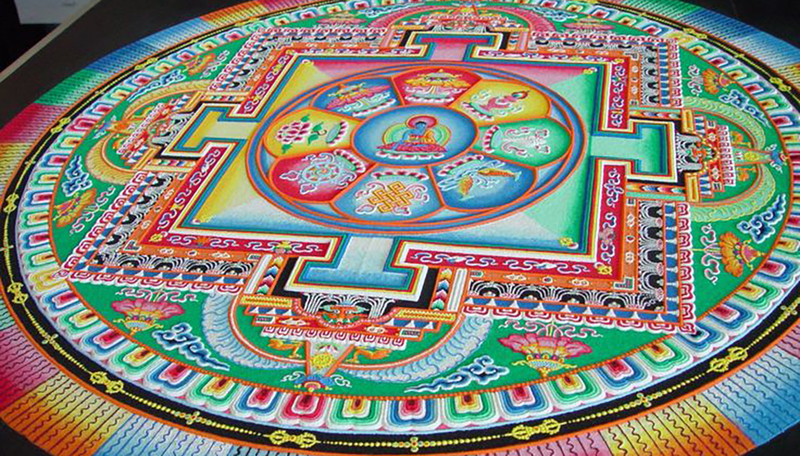 Lama Deshek's construction of the mandala will take place April 2nd to 8th. The mandala will be on display until its ceremonial dissolution on April 15th. As you might imagine, an event such as this requires quite a good deal of support. If you would like to volunteer to help, please fill out the form below so that we can contact you to arrange a schedule. Thanks to everyone who was able to come by the center for our Losar celebration. If you couldn't make it this year, try to make it next year. Its always a great time! You can check out a few pictures from the gathering HERE. Losar Tashi Dalek! Happy New Year! Join us for our Losar potluck lunch this Sunday, February 26th at 12:30pm. Please, bring your favorite vegetarian dish and/or non-alcoholic beverages to share. We will not be meeting Sunday, December 11th or Wednesday, December 14th. As we move into the holiday season, we will be changing our Wednesday Schedule, beginning November 16, 2016. Practice will now begin at 6:30pm. We will no longer have a book study or discussion on Wednesday nights. Of course, all are welcome to come and practice. The retreat will be held on Sunday, October 16, 2016. Practice will begin promptly at 9am and conclude at noon. Please, bring a vegetarian dish to share for a pot-luck lunch. We hope you will join us for this auspicious full moon session. Rinpoche has offered to lead us in practice on the morning of Saturday, August 13th. Practice will begin at 9 am and conclude at noon. We hope you will join us for this rare opportunity to practice with Rinpoche. His Holiness will meet with us at our normal time at 6pm on Wednesday, August 10th. We are most pleased to have such a venerable visitor to our little center. July 6th is His Holiness the Dalai Lama's Birthday! Come Help us celebrate this auspicious occasion! We will meet at our normal time at 6pm on Wednesday, July 6th. There will be a short practice with a long life prayer for His Holiness, followed by a dessert pot-luck. If you can, please bring a dessert dish to share. We are pleased to announce that Losel Maitri will be holding a Chenrezig meditation retreat! Meditation practice will begin at 9:00AM on Sunday, May 15, 2016. Everyone is welcome to attend the day-long event. There will be a lunch break and a few tea breaks throughout the day. Please, bring a vegetarian dish and/or beverages to share for a pot-luck lunch. We look forward to seeing you all for a day of practice and meditation! We will now hold our meeting during the week on Wednesday nights instead of Tuesday nights. Our next meeting will be Wednesday night, April 6th, at 6 PM for Book Study and 7 PM for practice. Sunday's meetings will not change. Remember, there is no meeting this Tuesday, April 5th. We will meet the following night, Wednesday, April 6th, at 6 PM. "Today we pay special tribute to the courage and determination of the Tibetan people, so many of whom have given their lives for our just and noble cause. The suffering to which our people have been subjected during these decades marks the darkest period in our long history. The struggle of the Tibetan people is a struggle for our inalienable right to determine our own destiny in freedom. It is a struggle for democracy, human rights and peace. Most of all, it is a struggle for our survival as a people and a nation with a unique civilization." Please, join us in remeberance of the hardships endured by these peaceful people who, in their exile from and occupation of their homeland, have given the rest of the world the gift of their beautiful and unique culture. Thank you for your support. On February 29th, in an attempt to bring attention to the suffering of the Tibetan people, two young Tibetans self-immolated and subsequently died, one in Tibet, named Kelsang Wangdu, who was 18 years of age, and one in India, named Dorjee Tsering, who was only 16 years old. The sadness of this loss for the Tibetan community and all those sympathetic to their plight is difficult, if not impossible, to put into words. There will be a special practice held at our normal meeting time on this Tuesday night, March 8th. Please, join us for this practice. Help us to show support for and solidarity with all who have been affected by these tragic events. There is a new photo page with the pictures from this year's Losar celebrations. Losel Maitri now has a Facebook page. We will use this new page to help post important updates and schedule changes. Also, our Tuesday night book study is starting a new book. Join us to read and discuss this insightful text by His Holiness the Dalai Lama. May you all have a happy and fortunate New Year. It was good to see everyone who could make it to the Center for our Losar celebration and thanks for all the delicious food! If you were unable to attend, join us for a pot-luck meal this Sunday, February 14th at 12:30PM. Please bring a vegitarian dish to share and help us to continue our celebration of the Tibetan New Year. Together we'll all have a great start for the year of the fire monkey! We are pleased to announce that Losel Maitri will be holding a Vajrasattva meditation retreat! Meditation practice will begin at 9:00AM on Sunday, November 15th, 2015. 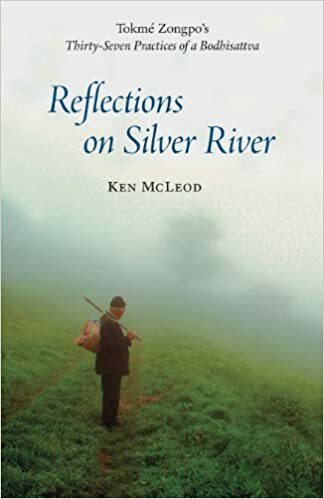 We hope you will join us for our study of the book Reflections on Silver River by Ken McLeod. Class starts at 1:00 PM on Sundays. See you there! Please, join us to complete our study of the book Introduction to Emptiness by Guy Newland. Book Study starts at 6:00 PM on Tuesdays. Hope you can join us! We are pleased to announce that Losel Maitri will be holding a Medicine Buddha meditation retreat! Meditation practice will begin at 9:00AM on Sunday, September 20, 2015. Many thanks to everyone for making our celebration of His Holiness the Dalai Lama's birthday such a great time! Click on the picture below to see photos from the event. If you couldn't make it this time, we'll look forward to seeing you next year! There will be no book study or practice this coming Sunday, July 5th, in observance of Independence Day. The following week, we will have a special gathering. Join us for a pot-luck meal in place of our regular activities on Sunday, July 12th, in celebration of His Holiness the Dalai Lama's birthday. Feel free to bring friends, family, and, if you can, a vegetarian dish to share. Come and help us celebrate. There will be plenty of food, fun, and fellowship for all! We hope you will join us for our study of the book Introduction to Emptiness by Guy Newland. We wish you a happy new year. May this year be your most fortunate yet! His Holiness the Dalai Lama and Lama Tenzin Deshek, October 24, 2014. Losel Maitri was recently awarded the Best of Birmingham Award for Buddhism Faiths and Practices. We are honored to receive this award, and are so happy to contribute to the Birmingham and Alabama community. Book study and practice on Tuesday November 26 is cancelled. Also, the Introduction to Buddhism class on Sunday, December 1 is cancelled (but we will have Sadhana Practice at 2pm). The Sunday Intro to Buddhism Class will be cancelled on November 3rd and 10th. Thanks! Please join us this Sunday, September 29, at 2pm for tea and cookies instead of our regular Sadhana practice. Please feel free to bring a small dessert or beverage for everyone to enjoy! The Intro to Buddhism Class will still be held at 1pm. Please come for class and stick around for tea and cookies! The Introduction to Buddhism Class for this Sunday, September 15 is cancelled. Sadhana practice will still be held at 2pm. The Introduction to Buddhism Class and Sadhana Practice for this Sunday, September 1 is cancelled. We will resume our regular schedule on Tuesday, September 3rd. Have a good holiday! Happy 78th Birthday to His Holiness the Dalai Lama!! Come join us on Saturday, July 6 at 12:30pm for a vegetarian pot luck to celebrate His Holiness's birthday. Please bring any veggie dish, drink or dessert you'd like. Remember to come to our new location, 3224 Green Valley Road. We are very honored to have Ken McLeod, the author of Wake Up To Your Life, join us this Sunday, May 5th, for a Question and Answer session. We read and discussed this book at length on our Tuesday Book Study, so this is a fantastic opportunity to ask the author any questions you may have. He will be joining us at 2pm, right after the 1pm Intro to Buddhism class. Please join us for this special occasion!